Few people symbolize the power of dreams better than Martin Luther King. Today, we celebrate the 50th anniversary of his famous speech „I have a dream“ (August 28th, 1963). This sparked my wish to write a Thank You post today to this wonderful & inspiring leader. Martin Luther King was awarded the Nobel Peace Prize in 1964. That same year, the US American Congress passed the Civil Rights Act. Other Rights Acts followed. As a consequence of the various civil rights movements following the anti-segregation movement in the USA, multicultural issues gained momentum. When I spent a Fulbright Year in the USA in 1989/90, I had the wonderful opportunity to explore my interests in cultural diversity beyond disciplinary boundaries. I thank Prof. James Banks & particularly Prof. Gerry Philipsen at the University of Washington for teaching me about the US American perspectives on cultural diversity. It was a mind opening experience for me as a very young student with bicultural backgrounds raised in Germany. Mind you, Germany was not ready for these issues at this time at all. The Berlin wall had just come down and it took many years for Germany to come to terms with its own multicultural realities. My studies in the US nevertheless have strongly inspired my academic, training or consulting work since (e.g. cf. Soraya, 1994; 1998; Soraya-Kandan, 2001; 2012) . When I talk to leaders today about historical backgrounds of diversity and inclusion, I remind them, that not too long ago, the whites among us could not have sat next to Barack Obama on the bus. Racial segregation ended in the USA only in 1968/70. The memories of this recent history are still vivid to those who witnessed these protests. The world commemorates this date, for King’s speech was not just a speech to Americans. His dream is not just a dream for Americans. It became an inspiration and vision for the world. The successful struggle ending the apartheid system in South Africa in 1994 had its tribute to King’s influence on the Black Consciousness Movement and the Civil Rights Movements in South Africa. In many countries similar social changes to those in the USA in the 60ies and 70ies have developed until today and are still developing. The momentum multicultural issues gained through the various civil rights movements lead to curriculum reforms, e.g. in education, and diversity measures in the workfplace. Many companies today recognize the importance of diversity & inclusion matters. International companies today recognize the importance of diversity & inclusion matters. It was only in 2005 that Germany acknowledged to have become an immigration country ratifying a Zuwanderungsgesetz. Since then, there is increasing momentum in diversity & inclusion matters in Germany, in enterprises, NGOs, or public administration. Still struggling with the breath of dimensions diversity is operating with, many German organisations have started realizing the connections between various social movements and their fight for fairness. They also see the benefit of creating diversity climates that allow for vary different types of collaboration, innovation and performance. 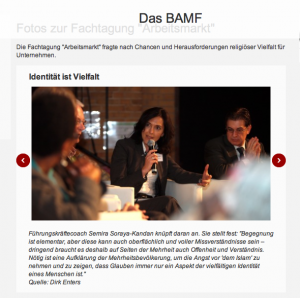 The German Federal Office for Migration and Refugees (BAMF) e.g. organized a conference on “Muslims and the labor market” last year where I experienced a clear increase in respect, recognition and curiosity for cultural diversity in the German population. And this year the office run its “Nürnberger Tage für Integration” with the headline: “Wir verändern uns! Wie demografischer Wandel und die neue Vielfalt Deutschland prägen.” – a motto I had waited for for more than two decades. Sufficient changes? With the NSU cases, Germany has some severe racial violations to digest. By far, not sufficient. But there is now a public recognition of these deficits. Germany Federal Anti-Discrimination Agency published its first report on discrimination in education and at the workplace just some days ago. Hyperconnected people – made for sharing dreams? Martin Luther King and his many companions did not stick to dreams. 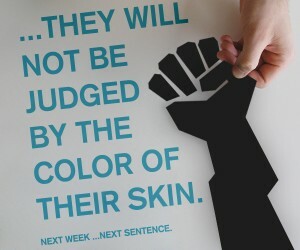 They stood up for their rights with the confidence that they can change society for the better. He is said to have had more faith in the USA and its constitution than his critics. Sometimes, recognizing who we are is the bigger challenge. We need more dreams, more dialogs, and more wholehearted deeds to realize the new society we have become and the next society we are about to become. We all still have a dream. Thank you, Rev. Dr. Martin Luther King Jr.!